Love reading your thoughts... food for... well thought ! Love this post! I can relate to all of the things you mentioned. Especially the inside sentiment! Super cute card too! Thanks. I need more "inside sentiment" stamps! 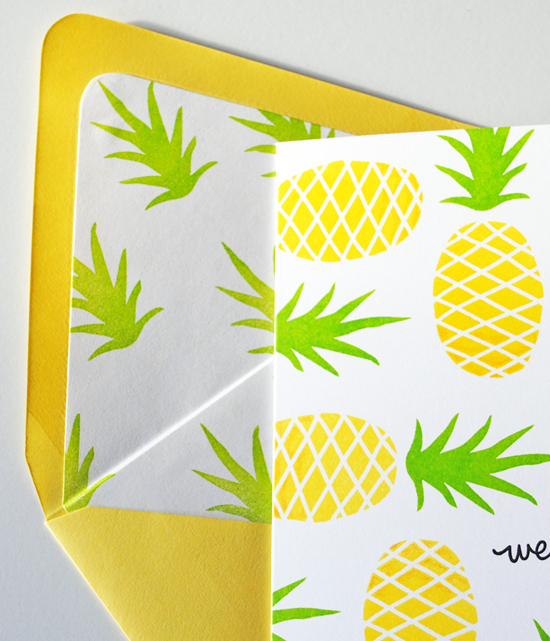 I usually do an inside sentiment AND repeat one of the images from the front -like i'd put the pineapple on the bottom right corner of the inside too, and also on the envelope too! But then i tend to make cards with specific people/events in mind, rather than have a stash of prepared ones. I have found the Winnie & Walter 'the big, the bold...' sets really handy for supplying lots of great words you can put together for the inside. 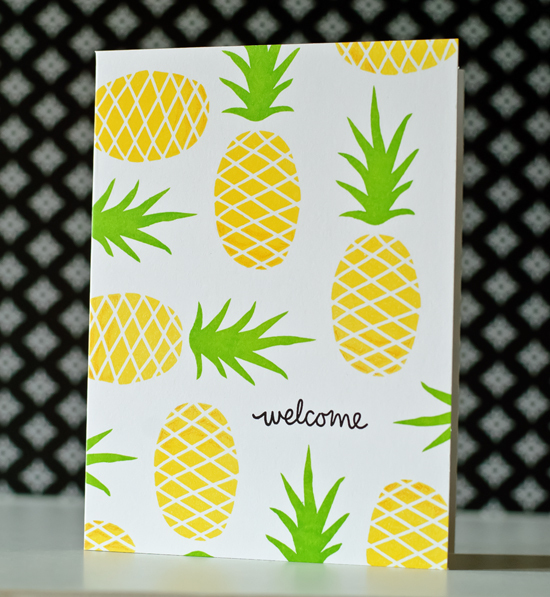 such a great looking card with the fun pineapples! I am sure your new neighbors enjoyed it, even if they didn't say anything to you. thanks so much for stopping by my blog and leaving such encouraging comments! it means a lot! Joan can I get inside your head? Love your theories and asides! LOVE love this super professional and cool card! We love this post! SO FUN (and funny)! Your title caught my eye. Great post. First, I love your card! The colors, the design -- outstanding and infinitely cheerful. I agree with your thoughts more and more all the time. Then sometimes I think "why make a hand stamped card if it doesn't look hand stamped". I mean hand stamped in a good way. Among the cards I sell, the ones with more layers and doodads get snatched up quickly, so I have to wonder. I'm trying to reach some kind of in between spot I guess. I totally agree about the sentiments, and while I love a well-turned phrase, I do prefer usable, everyday sentiments. A recent conversation with daughter#1: N: mom your cards are so cute. Me: thanks... do you need any? N: no, I don't give cards, I'm terrible about that. N's son Sam [age 9]: what's the big deal about a card, anyway? Me: Remember the card I brought you after your surgery [two years prior]? Sam: OH the one about the toads? Yeah, that was funny. Me: How did it make you feel? Sam: It made me feel happy. Me: That's the 'big deal' about cards, Sam. Someone took the time to say what was in their heart, just for you. Sam: Oh. Yeah, that is nice, Grammy." Blotchy, crooked, imperfect - that's me in a nut shell - the people that get our cards are, more than likely, grateful and sincere if they say thank you. I'm betting your neighbor loved the thought, even if she isn't a paper crafter. She'd be crazy not to. "For reals." LOVE this! You said it straight from the heart and touched so many of ours... Nice card too! Well, she's going to love this. I show my mom my cards....every time she opens them...EVERY time I say, I dont have a sentiment inside yet...... LOL..
You Are too funny. Just found you through Gina K.,s page. Boy, did you lift me up. Thanks Joan I am a fan. This is crazy sweet DIY tutorial!